that was first used by the Society for Learning Analytics Research in the inaugural conference in 2011, and that is essentially that learning analytics are the measurement, collection,and analysis of reporting of data, specifically we want to look at learners and the context of learners, because we want to better understand what’s happening with learners, the environment they’re involved in, and how can we improve that to make a better impact on the individual students, but also to help learners in, or the teachers themselves improve their teaching practices, and ultimately, of course, to give institutions the data, the feedback, that they need in order to improve their practices and how they support students, and how they support teachers or faculty as well. There’s a significant upside to the use of data in the educational experience. Art Graesser, from the University of Memphis, made a statement that through the use of analytics, there is an escalation of the speed of research on many of the problems that exist in education. Ultimately then, we can do analytics work around everything from social interactions to the types of space that individuals are a part of, to their use of systems such as a learning management system. Also, to start adapting and improving the content and the learning experience for each individual learner. 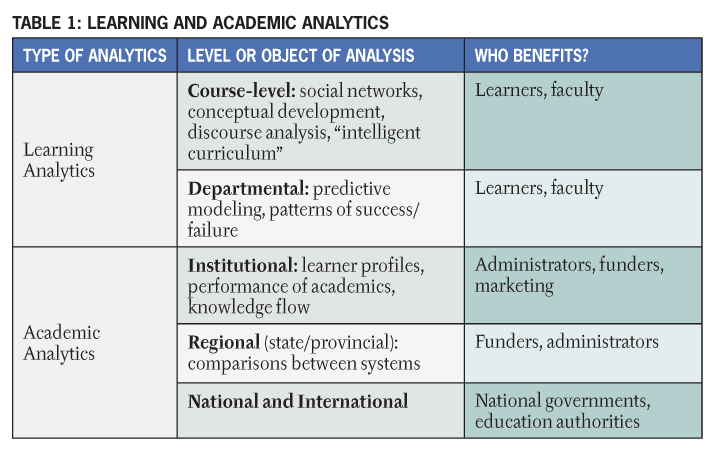 Digital Learning Analytics MOOC. U of Texas, Arlington.